Glamorgan's Mark Wallace is "proud" to be the county's first ever specialist wicket-keeper to score 10,000 runs in first-class cricket. 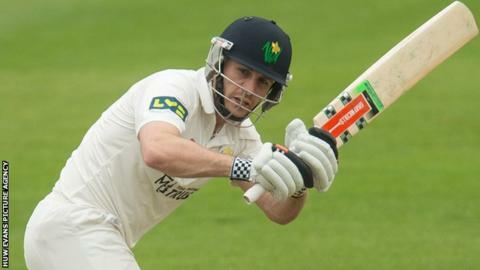 Wallace, 33, passed the landmark figure despite being dismissed for eight in Glamorgan's drawn opening game away to Leicestershire. "I'm happy to tick it off, it's something I'm quite proud of," he said. "I was quite relieved as a few people have talked about it for a few games and I've not quite got there." Wallace, who made his debut in 1999, has been an ever-present in more than 200 County Championship games for Glamorgan. "Hopefully there's a few more years and a few more runs in me yet," he said. "There's a lot of people who have worked hard with me on my batting over the years, from my father throwing countless balls at me as a child, through a lot of coaches I've had at Glamorgan over the years." Glamorgan declared on 227-7 on the final day at Grace Road, setting Leicestershire a theoretical target of 306 off 50 overs. But former Glamorgan player Mark Cosgrove scored an unbeaten 59 to steer the hosts to 141-3 at the close. Glamorgan head coach Toby Radford declared himself "very pleased" with the overall performance. "I think over the four days we played some excellent cricket," said Radford. "With three wickets down early [in the Leicestershire second innings] we thought we had a real sniff and a good chance of winning the game. "I'm a little bit disappointed we couldn't cross the line but overall a great four days cricket and I'm pleased to take some points away." Glamorgan must now prepare to face promotion contenders Surrey - including controversial former England batsman Kevin Pietersen - in their first home game at the Swalec Stadium starting on Sunday. They still hope to have Australian paceman Michael Hogan back for the following match against Derbyshire in Cardiff on 3 May.